With consumers turning to online for more and more of their purchases, there’s a renewed emphasis on the brand experience of receiving products through the post. A strong experience at this new ‘first moment of truth’ can engender strong brand affinity; a poor one can break it. It’s become such an important part of the brand experience that unboxing videos garner millions of views. So what makes for a great branded experience for consumers when they receive products through the mail? That was the challenge that long term partner Reckitt Benckiser approached us with. Through in depth ethnographic consumer studies, we worked to understand each step of the experience. To understand how your brands perform in this channel, you need to ‘unpack’ each step of the journey. That included the UX with the brand online, and then how shipping design needs to perform for consumers, providing strategic thinking on how ‘Ship In Own Container’ (SIOC) bespoke packaging can add value, as well as forensic detail on how each stage of the opening journey. The output brought the challenge to life for the client team, helping them understand how their brands perform through this channel, how they might begin to build in extra value for parts of their portfolio, and even how strong SIOC packs can make brand ambassadors of consumers. 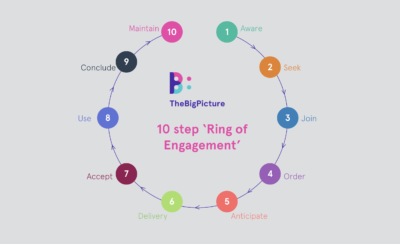 The output helped inform our Ring of Engagement model for Direct-to-Consumer (DTC), which explores what brands need to think about at each stage of the process.